Lurking behind this evening of ghost stories is local playwright Steve Patterson, whose collaboration with actor Chris Harder led to a Drammy-winning one-man show in 2006. Here, he presents three well-crafted tales that produce some genuinely chilling moments, helped by solid performances from Ben Plont and Trisha Egan and some simple but effective stage trickery. This is the final weekend. An odd run regarding the press. There were scads of shows opening this February, which is good, I suppose, in that it indicates the vibrancy of Portland theatre: for a mid-sized city, there’s just a hell of a lot of production going on here. We started off with a ‘top five’ pick from the Oregonian, and then they completely forgot about us until today (closing weekend, alas), when they gave us a listing but no review. Followspot, a Portland theatre blog, gave us a spot-on perfect review for the show. We did an interview on KBOO radio–thank you, Dmae Roberts–got listed in the Tribune in a favorable way, popped up with listings in a lot of small papers, and got a fun review from Lewis & Clark College’s student paper, The Pioneer Log. Got a lousy review from the Willamette Week (though sometimes that plays in your favor), and the Mercury ignored us except for a listing on their website and a brief mention in their blog. I can usually squeak out a little more press coverage than that, but I think there was just too much stuff going on; everyone was competing for ink. We did do a lot of Internet marketing with the this piece (including a very popular short online video clip), and that and some pretty good word of mouth (which is always the most effective promotion channel) lead to a solid run with a couple sold-out nights and only one small house. Ah. “Dead of Winter” completely sold-out last night–actually had to turn away two last minute theatre-goers without reservations, and the audience was with us every step of the way and left with smiles. When you’re down in the trenches, trying to put this stuff together, it’s easy to lose sight of the rewards, but nights like that remind you what the struggle’s all about…and why working in theatre is so addictive. Today, I’m just riding it. Last night, I saw Dead of Winter, a collection of three short plays, ghost stories, really. It was like attending Le Grand Guignol in February. Each of the vignettes were short on gore and special effects, but still managed to be creepy as all hell and present a couple of good “jump” moments. I’d love to see this same crew put together something in a similar vein for Halloween. I’m a sucker for small-scale theater like this. I really enjoy seeing what can be done in a modest space, without a lot of flash to spend, with local playwrights and actors. The venue was Performance Works Northwest, 4625 SE 67th Avenue, off of Foster. The show runs Thursdays, Fridays, and Saturdays through February 23rd. Tickets are $10 in advance, $12 at the door, and $10 for students and seniors. Thursdays are sliding scale. Tickets can be purchased online at http://www.theblustockings.com. For reservations, call 503-777-2771. From a playwright’s point of view, it’s extremely satisfying to watch a play connect with the audience, to feel them leaning in, drawn by the story. And, in the case of this show, occasionally shrink back. It tells me the stories are solid and engaging. And fun. You get so damned wrapped up in details that it isn’t until opening night that you remember what you enjoyed about writing the pieces and the enthusiastic response the piece originally prompted from your actors. 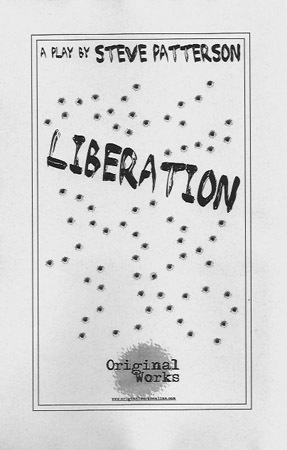 This journey began on a beautiful summery day, sitting in a coffeehouse garden and knocking ideas around with my partners in Pavement Productions and my new co-conspirators, The Bluestockings, and it took me to a literally dark and stormy night, with a full capacity crowd and extended applause. We’re three days out from opening “Dead of Winter.” I’ve been at the theatre much too much, terminal exhaustion is setting in, and I’m entering that space where everything either makes you laugh hysterically (literally…hysterically) or makes you feel like you’re going to fall apart…crack…tinkle, tinkle, tinkle. There are tons of decisions to be made and details to take care of, and you can’t find your pen. Then you can’t find your paper. Then when you find pen and paper you can’t remember what you were going to write down. The good news is that, after writing the plays, hearing them read, hearing them read three million more times, hearing little snippets of them read over and over, seeing them staged, seeing little pieces of them staged over and over, repeat and rinse as needed, there are still moments that raise the hair on my arms. You get so numb to what’s happening that it’s almost impossible to gauge how it will feel to an audience exposed to it fresh and finished. I think it’s going to work. I think. I think, I think, I think…. Or something like that. Maybe she says “weasels ate my rowboat.” I can’t really remember. I know at some point last night, someone was talking about butchering an aardvark, and I’d swear I hadn’t written that. I kind of like aardvarks. Does any of this make sense? Hell no. Which I think is exactly the point: when you die, it’s all dark, you’re confused, you can’t see, and then there’s a tunnel of white light, and you follow it, follow it, until it’s right in front of you, everything white, all the world white, blinding, encompassing light…. And you realize you’re staring up at a lighting instrument and the lamp has burned a hole in the gel. One week out from Dead of Winter, and that weird, rising feeling of anticipation keeps crawling up my neck and taking me by surprise. I’ll be having a conversation with an ordinary (non-theatre) human being, and suddenly I’ll be in a darkened theatre, watching light cues to be. Or I’ll be taken by a sudden panic: whose bio do I still need? Did I forget any props? What about…? What about everything, pretty much. Tomorrow we move into the space, build a set, hang lights and sound tech, and pretty much enact all the planning, e-mails, telephone calls, notes scribbled on Post-Its, intentions, visions, and compromises production entails. The funny part is just about the time you’re feeling the most tired, the production begins to feed you back. You give to it, it gives to you. The thrill of realization, of an idea in your head becoming reality (or at least theatrical reality). It’s a strange moment, speaking as a writer. Because, once upon a time, you sat by yourself (or, often in my case writing in coffeehouses, in the company of strangers), and this dream, these series of images, these voices, came to you, and you wrote them down. You experienced them along with the characters. And then time passes for the fever to subside, and you look at the script again with a little distance. You can still feel the place it came from, but you can also be a bit more objective, and you begin to fix mistakes, clarify, shape. Then you begin the long process of sharing it with others, taking in their impressions, and adjusting further. Finally, you give it to a director, actors, and techs, and the process sort of reverses. From text on a page, distilled from the mind’s images, images begin to take shape in real time. It’s like watching your own dream come to life and immerse you. It can let you down, but it can also sweep you away, your eye and mind synching up into a hyperreality that leaves you high. We’re not quite there yet, but we’re getting there. We are indeed getting there. P.S. 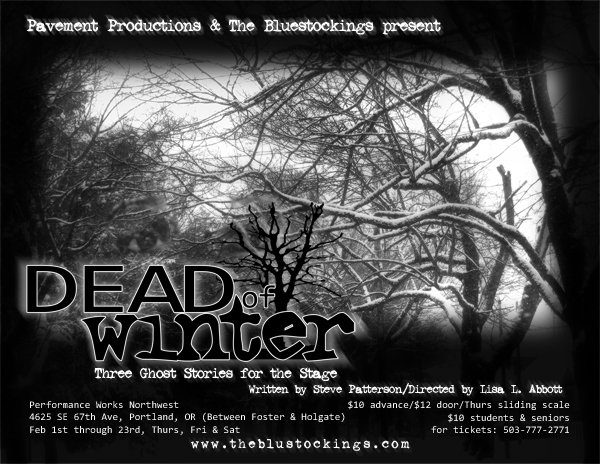 : Check out the Dead of Winter video teaser at The Bluestockings and, if you like what you see (and/or it unnerves you), please pass on the link. You can, of course, buy tickets there too.